It must be challenging for any writer to compile a “selected” collection of works and to decide when such an anthology serves a purpose. How to choose which poems to reprint? Who gets the final say—the poet, the editor, or the court of popular opinion? In the last instance, suppose the poet has concluded that a well-loved and much-anthologized piece need not be printed again in order to make room for an equally good but less well-known poem. Now suppose the writer’s been publishing for over six decades; combing through that volume of work would entail a life review on many levels (life of the mind, public and private life, life of poetics). Daunting indeed. Donald Hall’s 2006 Selected Poems, White Apples and the Taste of Stone—now released in paperback with an audio CD of Hall reading some of his works—does not mention an editor. It seems he managed this task alone, although he has written and spoken often about his reading-relationships with colleagues, and that sort of feedback may have played a role in particularly tough decisions. Most collections of this type are arranged chronologically by the book in which the poems first appeared. Hall’s approach in this tome, and at over 400 pages it certainly earns that moniker, takes the reader on a more intuitive exploration of the poet’s work. The chapters are not set off by book title but, rather, by images and phrases from one of the poems in that section. In addition, many of the section titles appear with one or more epigraphs which offer pointers for the reader to consider in terms of topic or of tone. Though the text is largely chronological, Hall sometimes inserts a later version of a poem after the first version (see the first chapter’s versions of “Exile” as one example). The nine “Innings” of his “Baseball Poems” are interrupted by the selection “The Museum of Clear Ideas” before returning to “Extra Innings” later in the book. I haven’t yet mentioned the poems themselves. There are reasons for that; firstly, I have long been an admirer of Hall’s poems and prose, so I’m biased; secondly, the poems themselves have received wide reviews over the years and anyone who’s interested in discovering critical commentary about a well-known “man of letters” and past US Poet Laureate should have no problem doing so. It’s a challenge for a reviewer, too, to do anything like a close critical read of so monumental a text—the poet was perhaps 23 years old when he penned the first poems collected here, and nearing 80 when he wrote the last ones (“Recent Poems”). 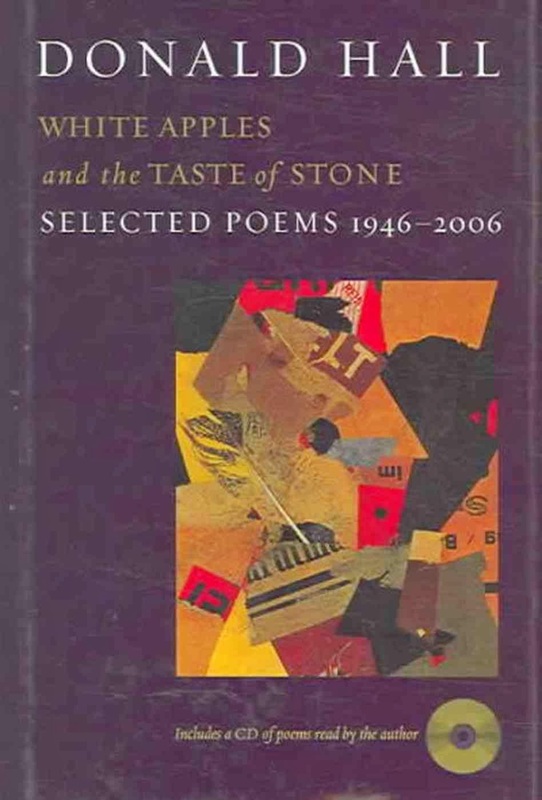 While White Apples and the Taste of Stone is perhaps too comprehensive to serve as an “introduction” to Donald Hall’s body of work, it is a wonderful companion for the person who has enjoyed at least some of Hall’s poems and wishes to find more. If the reader only knows Hall’s more free-verse pieces, this book reveals the depth of Hall’s knowledge concerning the use of forms, particularly metrical approaches (and a commentary in the form of a sestina that is humorously self-referential). For readers attracted to Hall’s poems of place, the chronology and the poems chosen here present the writer’s devotion to Kearsage and the house his grandparents inhabited. The themes of baseball, romantic love, and family history repeat and morph as the writer ages and learns not only more about life and loss but also more about poetry and how to express those ideas. The tropes and plays-on-classics Hall employs in his Horsecollar’s Odes appear early on, with his often wry use of allusions, as in “Four Classic Texts.” If you prefer Hall’s more narrative, history- and culture-centered poems, you may be surprised to find that you also like aspects of his baseball poems or his mashups of Horatian odes. And if you don’t like them, you can skip past them and still find much to absorb in this book. What the reader wants, I think, in any one-poet collection spanning decades of work, is to discern the writer’s development, to begin to see how one period led into another and whether the voice stays consistent; also to discover whether topic changes, and perhaps why (the biographical and psychological aspects of the writing self), and to learn whether the poet exhibits different influences or experiments with style, pattern, form over time. If these are reasons you would consider delving into this collection, you won’t be disappointed by Hall’s choices. I have to add that, at $16.95, including a really well-produced CD of Hall reading his own work—which in itself can deepen a reader’s appreciation of a poem—this book is quite a bargain.